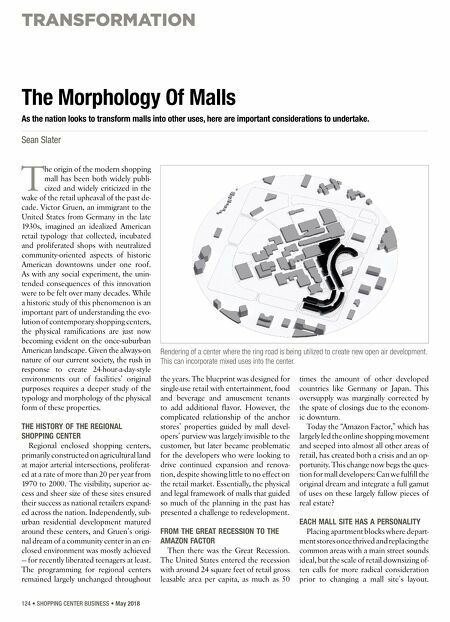 TRANSFORMATION 124 • SHOPPING CENTER BUSINESS • May 2018 T he origin of the modern shopping mall has been both widely publi- cized and widely criticized in the wake of the retail upheaval of the past de- cade. Victor Gruen, an immigrant to the United States from Germany in the late 1930s, imagined an idealized American retail typology that collected, incubated and proliferated shops with neutralized community-oriented aspects of historic American downtowns under one roof. As with any social experiment, the unin- tended consequences of this innovation were to be felt over many decades. 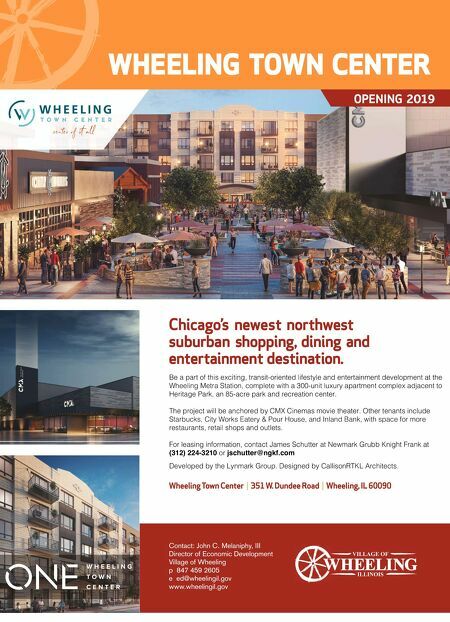 While a historic study of this phenomenon is an important part of understanding the evo- lution of contemporary shopping centers, the physical ramifications are just now becoming evident on the once-suburban American landscape. Given the always-on nature of our current society, the rush in response to create 24-hour-a-day-style environments out of facilities' original purposes requires a deeper study of the typology and morphology of the physical form of these properties. THE HISTORY OF THE REGIONAL SHOPPING CENTER Regional enclosed shopping centers, primarily constructed on agricultural land at major arterial intersections, proliferat- ed at a rate of more than 20 per year from 1970 to 2000. The visibility, superior ac- cess and sheer size of these sites ensured their success as national retailers expand- ed across the nation. Independently, sub- urban residential development matured around these centers, and Gruen's origi- nal dream of a community center in an en- closed environment was mostly achieved — for recently liberated teenagers at least. The programming for regional centers remained largely unchanged throughout the years. The blueprint was designed for single-use retail with entertainment, food and beverage and amusement tenants to add additional flavor. However, the complicated relationship of the anchor stores' properties guided by mall devel- opers' purview was largely invisible to the customer, but later became problematic for the developers who were looking to drive continued expansion and renova- tion, despite showing little to no effect on the retail market. Essentially, the physical and legal framework of malls that guided so much of the planning in the past has presented a challenge to redevelopment. FROM THE GREAT RECESSION TO THE AMAZON FACTOR Then there was the Great Recession. The United States entered the recession with around 24 square feet of retail gross leasable area per capita, as much as 50 times the amount of other developed countries like Germany or Japan. This oversupply was marginally corrected by the spate of closings due to the econom- ic downturn. Today the "Amazon Factor," which has largely led the online shopping movement and seeped into almost all other areas of retail, has created both a crisis and an op- portunity. This change now begs the ques- tion for mall developers: Can we fulfill the original dream and integrate a full gamut of uses on these largely fallow pieces of real estate? EACH MALL SITE HAS A PERSONALITY Placing apartment blocks where depart- ment stores once thrived and replacing the common areas with a main street sounds ideal, but the scale of retail downsizing of- ten calls for more radical consideration prior to changing a mall site's layout. The Morphology Of Malls As the nation looks to transform malls into other uses, here are important considerations to undertake. Sean Slater Rendering of a center where the ring road is being utilized to create new open air development. This can incorporate mixed uses into the center.